Do you have a custom domain that you would like to use instead of our "geni.us/" domain? No problem! You can now better brand your links by using your own domain to ensure that your branding and message aren't lost in translation. There are a few steps that are required both on your side and ours to get the custom domain set up, so please contact us to get the process started. Once you're in touch with us, and we're ready to move forward, you can use the below instructions to set up the DNS on your side. Note: Custom domains are currently only available as an Add-On for $50 a month. Please let us know if you have any questions about this and we'll be happy to help! There are two options for configuring your custom domain. Have us host the DNS. This is best if you DON'T want to run other services under the same domain. This option means the domain must be dedicated solely for geni.us links (e.g., NO blog, mail, website, etc., can be used on the domain). This is best if you DO want to run other services under this same domain (e.g., blog, website, email, etc), and/or are OK with a subdomain. Setup - Using the domain only for your shortened geni.us links. 3. Once the DNS settings have been saved, reply to the thread you already have going with us about your custom domain. We'll ensure that the domain is now pointing to our services and run some tests. 4. 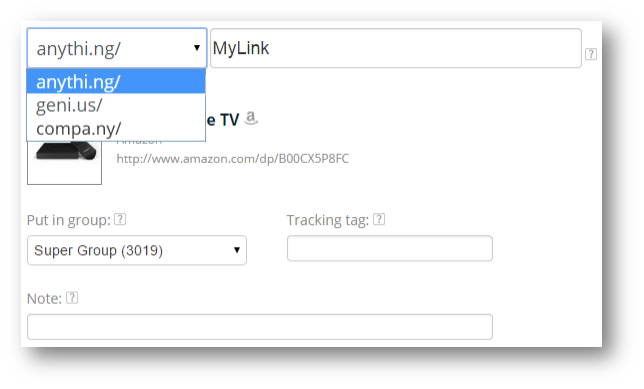 Once our tests are done, you'll be able to log into your account and use your own domain any time you create a new shortened link (see screenshot at top). 5. That's it! You're now taking full advantage of our global infrastructure which guarantees your links send each user to your chosen destinations as quickly as possible. Nice work. (Advanced) Want to host the domain yourself? If you'd like to continue to host your own domain instead of having us do so for you, please check out our advanced guide. Switching over from another URL shortener, like bit.ly? Make sure you contact us before doing any of the above! We'll need to coordinate with you to ensure there's no downtime when making the switch, so please make sure you let us know before changing settings. You'll also want to export all of your links, then pass them over to us so we can add them to your account and continue to serve them for you. If you're coming from bit.ly specifically, please reach out to us for assistance with making the switch.